Sometimes, life just doesn’t work out as we had planned. Dana knows about that. At two years old, after a mysterious start in life, she found herself in the home of a man who adored her. Life was good. It was all about her, then, suddenly, he died after they had had just three years together. Faced with the sudden loss, the man’s kind neighbors stepped in to provide stability to Dana in her time of need. Life again was good. She was familiar with these people. Just a little blip in her happy life. Unfortunately, time was marching on for her new adoring owners. Not getting any younger, they decided it was time to move into a retirement residence three years after Dana joined them. Of course, they selected a place where Dana was welcome, but the transition from a home with a yard and her private domain to an apartment where space was tighter and space had to be shared with yappy, unfamiliar dogs was just too hard. Even a professional behaviorist couldn’t seem to help Dana with her transition to this new environment. Her adoring owners decided that the best they could do for her was to allow her to find her happy place elsewhere—a very heartbreaking and selfless decision for them. 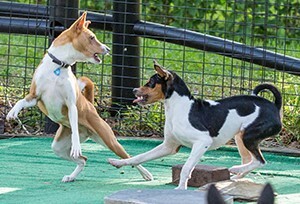 When Dana arrived at her foster home, she was not equipped with social skills that would make her at ease surrounded by a dozen other Basenjis. Fortunately for her, her foster hosts and hostesses are well-versed in welcoming newbies who don’t understand how to politely interact with other dogs. After a short period of time, she not only realized that they were not a threat, but that it was FUN to play with puppies! Eight years old is not too old to act like a pup. Suddenly, life was pretty dang good again, but there was still a little something missing – her own humans. Dana was ready to move on, so the search for her special humans began. 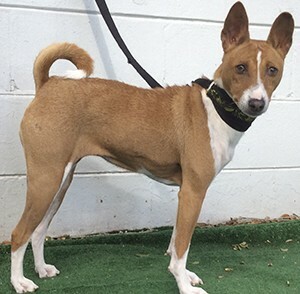 Not long before this, a family had lost their very old Basenji girl. She had been with them all of her life, but after 14 years, it was time for her to go wait at the bridge. She left a painful hole in their lives, understood by those of us who have experienced the same loss. While we grieve the loss, we revel in the joys that got us there. 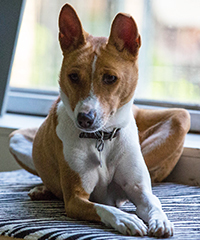 Finally, it was time to honor Trixie by moving on and opening their home to another delightful Basenji – Dana! It has been a wonderful time for both. Dana has wormed her way into their hearts, occasionally acting like a spiritual medium for Trixie, to the eerie delight of Dana’s new humans. They have continued her socialization by getting her out to doggy parks regularly. A bit unsure at first, Dana is now quite comfortable as a regular doggy park visitor. She has even played the role of foster hostess in her new home! We are looking forward to her help in that role again in the future. For now, she’s enjoying nightly kitty cat hide and seek games without a canine pal… “She’s so cute,” says one of her doting owners. Congratulations to Dana and her wonderful owners!